Whoever has placed the fewest statues receives the people's mercy in the next round. This can be a boon if that player is stocking up on supplies for a comeback! These peasants don’t know how to manage themselves. They need us, the nobility, to show them what they should do. And they need icons they can look to when the going gets tough. And what better icon than statues of ourselves? Of course, statues aren’t cheap. Surely the peasants won’t mind if we garnish their wages–just a little, mind you–to make these statues a reality. But–why have they grabbed their pitchforks? 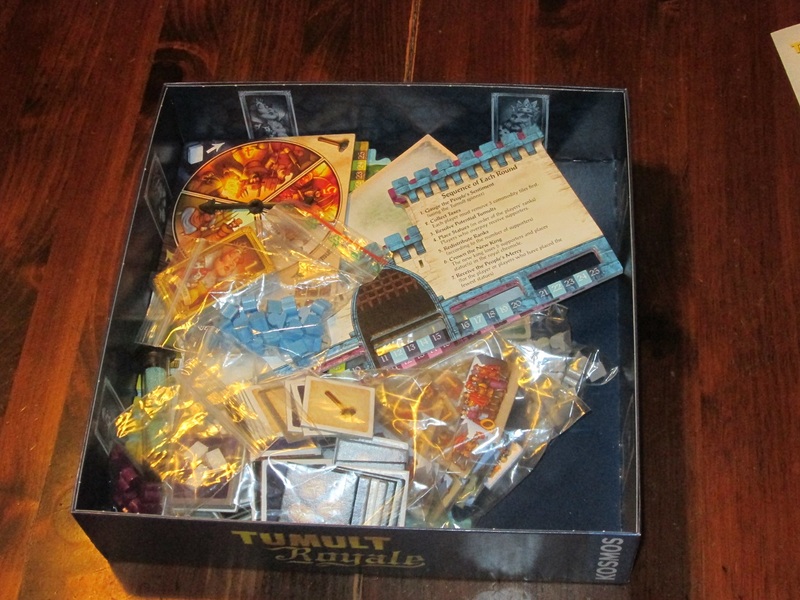 Tumult Royale is a partial real-time resource gathering/management game for two to four players. Players are nobles who are trying to tax the people just enough without causing a revolt in order to build statues of themselves in the countryside. The player who builds the most statues wins. Tumult Royale set up for two players. 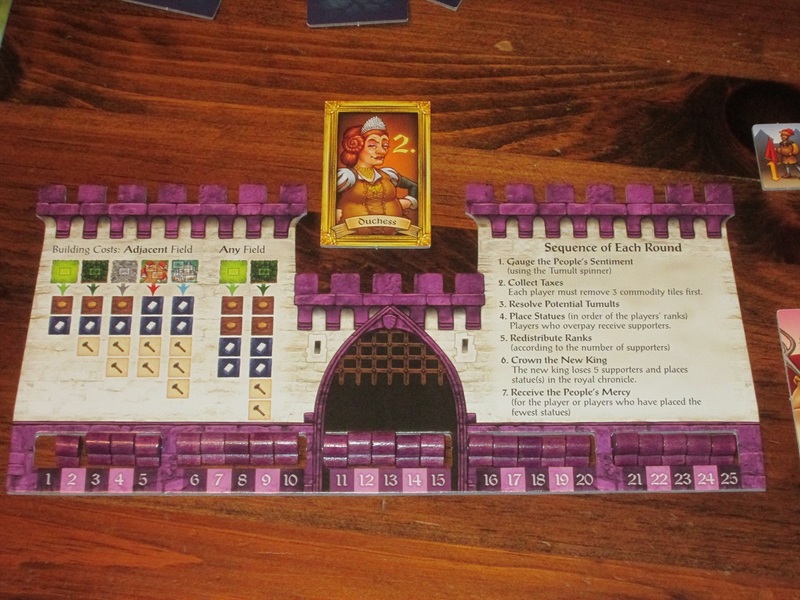 To begin, each player receives a castle board, twenty-five statues of their color, twenty supporters, a rank card, and a mercy card. 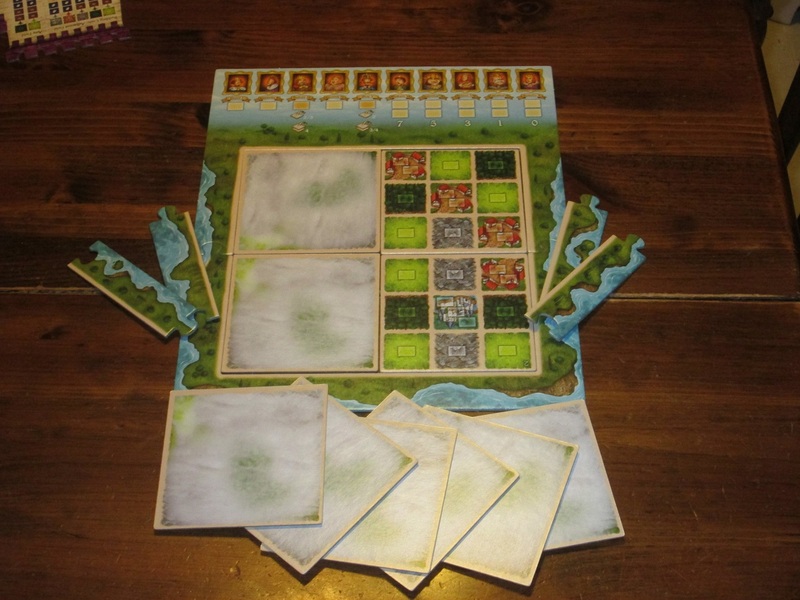 Players set up the central board based on the number of players in the game, and each player places one statue on an empty pasture space. 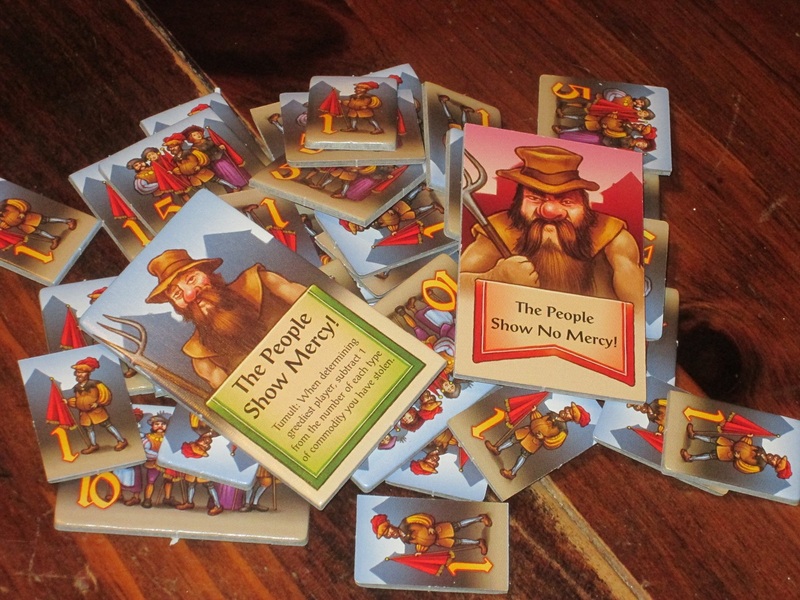 Players shuffle and place face down the commodity tiles for the game. Each round follows a simple flow. First, the king spins the spinner to “gauge the people’s sentiment” (how likely they are to revolt). Then players remove some commodity tiles from the center. 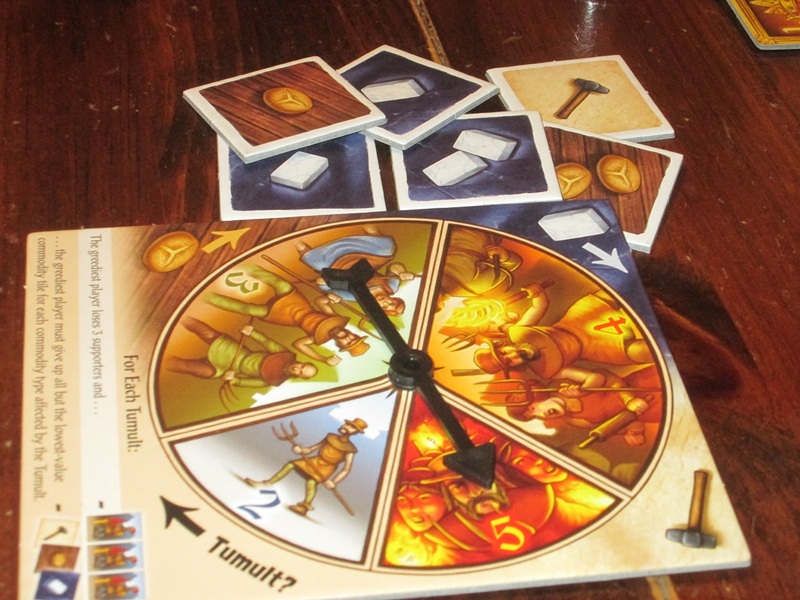 The player with the King rank flips the timer, and players have twenty seconds to take commodities from the center of the table and place them on their board. At the end of twenty seconds, any commodities remaining in the center are flipped up. There are three commodities (bread, marble, and tools). For each commodity that has fewer goods showing than the people demand on the spinner, there is a “tumult.” The greediest player (who claimed the most of that good) returns all but the least valuable tile to the center of the table and loses three supporters. Then players, in rank order, may build statues on the board, gaining supporters whenever they overpay. There will be tumults TONIGHT. The player who has the most supporters after building is crowned the new king and places free statues in the chronicle, as well as flips face-down board tiles when required. In later rounds, the game may end early at this point. Finally, the player who has built the fewest statues receives the player’s mercy, which makes him or her less likely to experience a tumult in the next round. 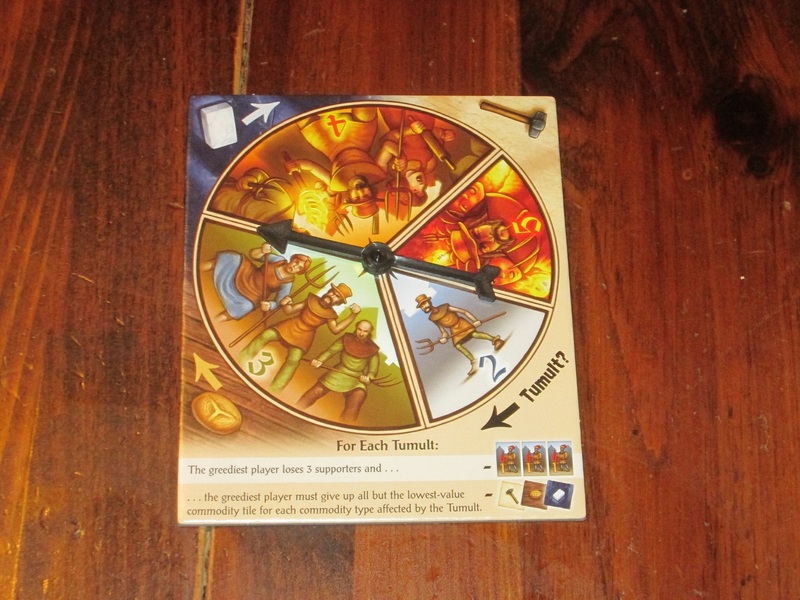 The game ends either at the end of the tenth round or at the end of a round when the difference between the player who has built the most statues and the player who has built the fewest breaks the threshold shown on the board. At that point, the player who has built the most statues is the winner. Battle Royale, or Tempest in a Teapot? Tumult Royale has one of the absolute best concepts I’ve seen in a game. I love the idea of taxing peasants, but only just enough so that they won’t revolt. I also love the lighthearted idea of building monuments to yourself as a way to win supporters to your side. But while I don’t hate Tumult Royale, I don’t love it either because for me it doesn’t live up to its lofty premise. 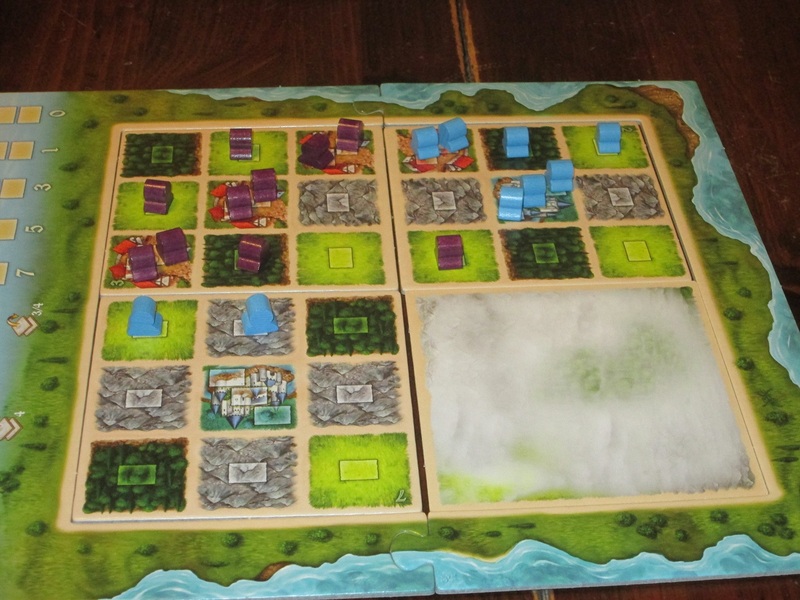 The player board is castle shaped and contains helpful information that eases play. This is a great resource. 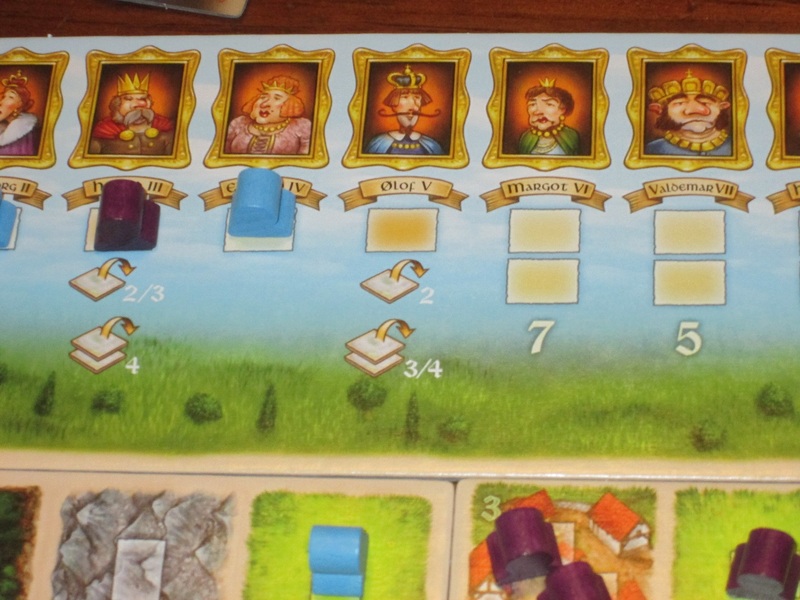 Tumult Royale is a hard game to talk about in that it doesn’t fit easily delineated categories. It’s a Euro game, kind of, in that you are collecting sets of resources to build things that will win you the game, and there’s not a lot of direct, take-that player interaction. Yet the game’s system of resource gathering is decidedly un-Euro: players simultaneously riffle through a pile of commodity tiles, hoping to find what they need, and in some cases it’s just lucky that you come back with the right goods. It’s a silly premise with a silly resource-gathering mechanism that’s bolted on to a more serious (and less novel) resource management game. The most interesting aspect of the game, however, is front and center, and it’s the most memorable part: players want to be bold in taking resources, but not so bold as to be the greediest. There is a strict and harsh penalty against the greediest player, but being the second greediest is the ideal place to be. I love this concept, where players are trying to thread the needle between playing it too safe and playing it too risky. The penalty is punishing enough to ward off cavalier play, yet playing without risks is not rewarding enough to grant players a win: this forces everyone into a middle ground of panic, which adds a lot of energy to the resource-gathering phase. Whoever has placed the fewest statues receives the people’s mercy in the next round. This can be a boon if that player is stocking up on supplies for a comeback! This is further highlighted by the changing sentiment of the people and the random removal of resources. Since players don’t know what the central pool will hold, they don’t know if the peasants will revolt based on what they take (and they will be more or less likely to revolt, depending on what is spun on the spinner). Further, they won’t know whether certain commodities are scarce or abundant. It’s tempting to pass on the 1-tool tile when you suspect there are better tiles in the pool, but you’ll be disappointed you didn’t get it if you later discover that the tool tiles were mostly removed at the start of the round. Again, the frantic resource gathering and the discovery of what’s in the pool once you start revealing tiles is the greatest strength the game has. The goal of the game is to place statues, generally by putting them in spaces on the game board. To me, this is much less interesting than gathering the resources necessary to build the statues. Unfortunately, the game loses steam quickly once you focus on the goal of the game. The closest analogy I can think of here is movies like Elf or Mystery Men. I enjoy the first half to three-quarters of Elf because Will Ferrell is being funny, and it’s a riff on secular Christmas lore that doesn’t take itself too seriously. Similarly, the first half to three quarters of Mystery Men is comedic gold as it plays with superhero tropes in an engaging way. Where both movies fall apart is when they become more serious because they have to advance the “story.” People have to believe in Christmas to get Santa’s sleigh to fly! (Boring.) The Mystery Men discover they actually do have super powers and fight the villain! (*Yawn. *) Admittedly, you might not want to watch a movie that doesn’t have a plot, but in both Elf and Mystery Men, the plot isn’t why you bought the ticket: you’re watching it for the gags, and you feel almost betrayed by the movie’s forcing the plot to a paint-by-numbers finale. It’s like a Saturday Night Live sketch that goes on too long. The central conceit is funny, but it’s hard to bring that conceit to a meaningful conclusion while keeping the enjoyment of it intact. The chronicle allows the player crowned king/queen each round to place additional statues. That’s how I feel with Tumult Royale: the central conceit is great, but because it’s a game and there must be winners and losers, the game is drawn down with a much less interesting mode of determining the victor. That’s not to say that the game isn’t balanced, or that the scoring doesn’t make sense; it’s just that, like Mystery Men, I’d rather inhabit the joke and forget the story than be drawn into the almost workmanlike reminder that this is a game and must behave the way a game is supposed to. Rank cards determine turn order. These are double sided, with male characters on one side and female on the other. Tumult Royale is meticulous in the way it scales, by both making the game board smaller and providing fewer tiles for the taxing phase. The game advertises play for two to four players. I’ve played with three and four, and even though the game scales to the number of players, I much preferred the game with four players. There’s more energy around the table, and even with more tiles in the central pool, more hands in that pool makes for a better experience. 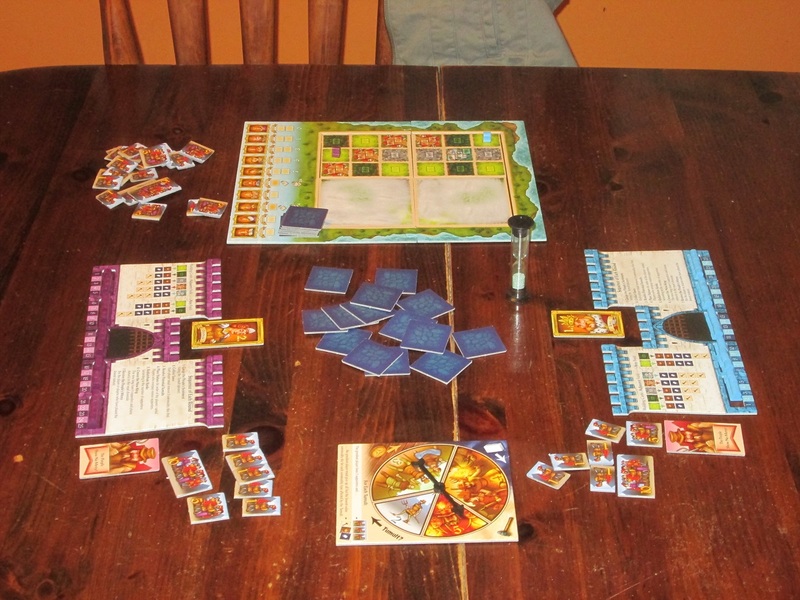 The components in the game are nice–the tiles are thick, the boards have a cutout area to hold your statues and easily keep score, and the seven steps of a game round (which could be difficult to remember otherwise) are easy to track on the player boards. The rank cards feature both male and female ranks (e.g., King and Queen), which is a nice addition, and the visual design of the game directs players in such a way that it’s easy to remember what to do. It was easy for me to jump in and teach the game each time we played simply because the game provides so many visual cues for the players. The game also advertises a helper app that offers a timer with sound (instead of the included sand timer) and a rules teacher. I used the app’s timer, but I found I could teach the rules faster than the app (a must for lunchtime play), and I think I’d prefer a regular stopwatch app to the slower Helper app. Still, this will be a boon for players who don’t like learning from rulebooks or who have trouble teaching rules. The playtime even with teaching has fallen easily within the one-hour range, making this a decent choice for lunch games. My one complaint in the components is that the box is larger than I would want it to be for the kind of game it is. There is a decent amount of air in the box for what’s included, and a smaller box would better reflect the gameplay you can expect. The package for Tumult Royale is nice, although the box is larger than I want it to be for the type of game that this is. All told, Tumult Royale is a decent game but not a great one. I like the components and love the premise, but I’d rather play a leaner game that is more of what’s interesting here. I think this game could work with casual players or in the family context, particularly with players who haven’t played (m)any real-time games. The rules are simple, the gameplay is more or less straightforward, and the theme is engaging. 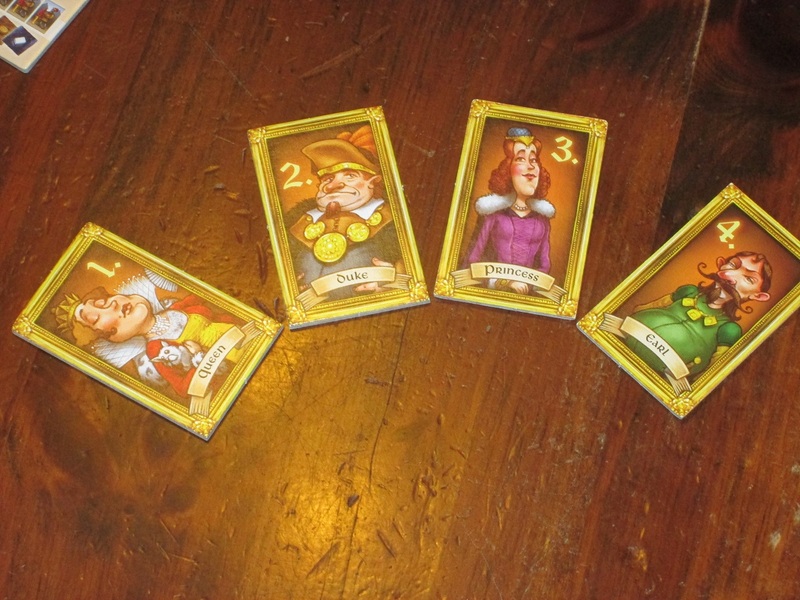 But for my taste, Tumult Royale pulls players in two directions–silly resource gathering! more measured resource allocation!–and it doesn’t work as well as I want it to. 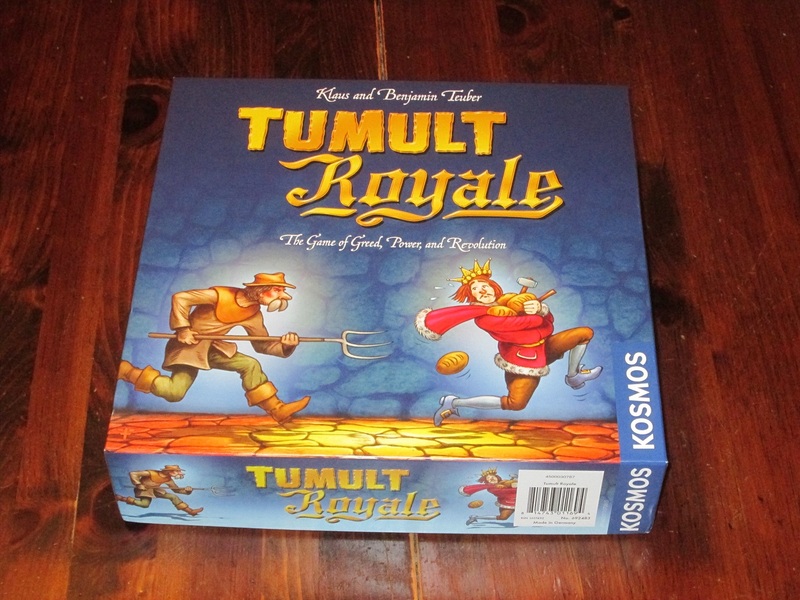 iSlaytheDragon would like to thank Thames & Kosmos for providing us with a review copy of Tumult Royale.